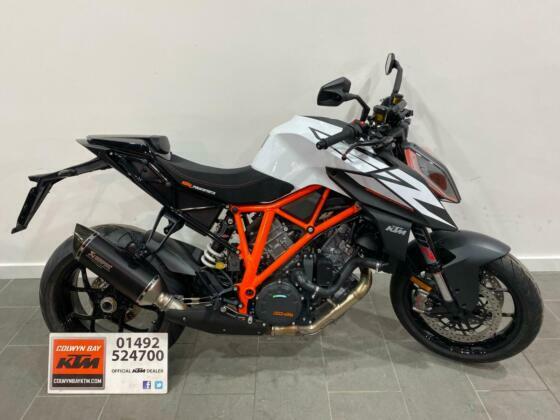 It's powered by a Euro 4 compliant liquid cooled 1,301cc V-Twin engine, producing 174bhp at 9,750rpm and maximum torque at 7,000rpm. Compared to the 2013-2016 model peak power is up 4bhp, the red line 500rpm higher, the inlet valves are now Titanium and the engine is now Euro 4 compliant. Ergonomically the riding position is slightly more aggressive with the handlebars being 5mm lower and 18mm further forward. You also now get an LED headlight, launch control, cornering ABS, cruise control, colour TFT dash, keyless ignition, a new Track riding mode and tyre pressure warning however the bike is somewhat heavier than the old model. The 10-spoke 17" front wheel takes a Metzeler Racetec K3 120/70 tyre and the rear a 190/55. Accessories include an Akrapovic exhaust, quickshifter, soft panniers/top case, race suspension, Carbon mudguards, and heated grips.